In modern Indian languages the word yajna is used to signify a great focussed and dedicated effort. The word yajna is derived from the verb root yaj which means ‘to worship’. It’s synonym is yaga. Vedic Rituals have not completely disappeared and yajnas have been performed even in the 21st century in India. A proper study of Vedic Yajnas, helps to understand the Vedas, because the mantras are arranged to suit the needs of the Yajna. The sulabha (sulba) sutras are concerned with the constructional and engineering aspects of the ‘Vedi’. The Vedi is loosely translated as altar in English, but the altars of the church are different. For us the Vedi is the place where the sacred fire will be placed and around which all the Brahmans sit. The following srauta sastras describe the method of performing the vedic rites. A yajna is defined as the tyaga (giving up) of a dravya (material) unto a devata (luminary). 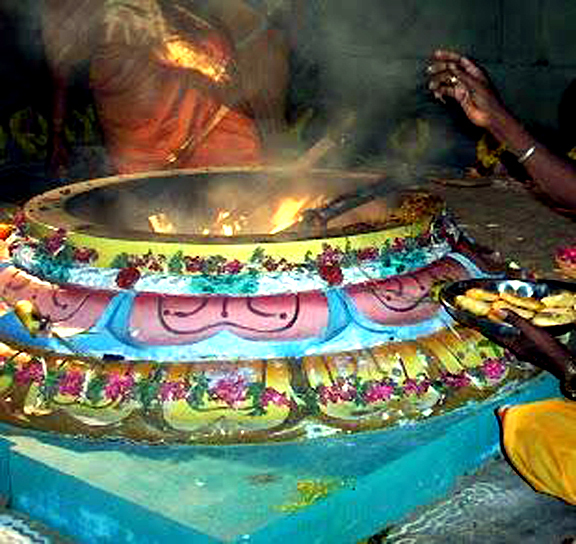 Homa is the act of pouring ajya (ghee) into the gryhya or domestic fire. This act continues in the later adaptation of deeparadhana using a ghee lamp, which must not go out during the puja. We learn from the Bhagavad Gita that Manavas and Devas sustain each other through yajnas. We offer them ‘havis’ and they bless us with rain and other good things. We take care of nature and nature takes care of us. Who can carry our offerings to the luminaries? Only one of them, someone who knows the way. So whatever we want to give the devatas we offer to agni and agni takes the offerings to the devas. (see Agnim Ile). The Yajamana is the person performing the Yajna is performed. He meets the expenses and claims the fruit. All the rtvkiks and other brahmans are their to help him perform the yajna and for this they collect a fee called the dakshina. Only grhastas (house holders – married men) of the brahmana, kshatriya and vaisya varnas, were eligible to establish the sacred agni and perform vedic rites. Since it was an expensive process (two cows had to be maintained for all the cow dung cakes and fuel sticks) and restricted travelling, grhastas usually waited till they were middle aged. The ahitagni, a man who had established such a sacred fire, had to maintain it thoughout his life and if any such fire went out, he would have to re-kindle it ceremoniously. Generally 3 fires were established, and when he died, these 3 fires and implements used in maintaining them would be cremated along with him according to the scriptures. If he took sanyasa, the fire would have to be discarded ceremoniously. In common parlance today.. the word yajamana is used in the sense of ‘the master or boss’, by the wife and servants, even if he has never performed a single yajnam in his life. The Yajamana selected the Rtviks. The Rtviks were preferably young men, well-versed in the Vedas, in perfect physical shape, from a good lineage and leading pure lives. The adhvaryu representing the yajurveda had 3 assistants: pratipasthata, nesta, unneta. The udgatr representing the sama veda had the 3 assitants: prastota, pratiharta, subrahmanya (Narada was an Udgata in some yajnas listed in the Harivamsa). The Brahma represented the Atharva Veda and his 3 assistants were brahmanacchamsi, agnidhra and pota. The 3 assistant were called dvitiyi or ardhi, tritiyi and padi and received a half, a third and a fourth of the fees paid to the mahartvijas or great rtviks. Not all the 16 brahmans are needed in all the yagas. A group of yajnas is called a samstha. As per the Bodhayana grhyasutras (1.1.18.21) yajnas can be classified into 21 samsthas. They are performed with the mantras from 3 vedas Rk, Yajur and Sama. Domesticated Animals, Wild Animals and Tree-plant products are offered in the sacred fire. The brahmans are paid to keep these alive. Yajnas can also be classified as svadhyaya (self-study), japa (repetition), karma (performing) and manasa (meditation). Manasa yajnas are considered the best. The first samstha are the Pakayajnas and they are 7 in number: Huta, Prahuta, Ahuta, Sulagava, Baliharana, Pratyavarohana and Ashtakahoma. They are meant for worldly gain and properity. Cooked offerings such as boiled grains mixed with butter are offered into the aupasanagni or the grhyagni. The Seven Haviryajnas are Agnyadheya, Agnihotra, Darasa-purnamasa, Caturmasya, Agrayana, Nirudhapasubandha and Sautramani. The havis is uncooked offerings like barley, rice, milk or clarified butter offered into the srautagnis namely the garhapatya, dakshina and ahavaniya. The seven Somayagas are Agnistoma, Atyagnistoma, Ukthya, Sodasi, Vajapeya, Atiratra and Aptoryama. here the main offering is the SomaRasa (an extract of the soma plant). The yajnas may be classified in other ways also. A model yajna like the darsapurnamasa is called a Prakrti yajna. This yajna may be modified into vikrti yajnas like the kamyesti yajna. (We know that Dasaratha performed the Putra Kamyesti Yajna to get sons.) Kamyesti Yajnas are for getting some Kamas or wishes fulfilled. When Vikrti Yajnas are described only the modifications are described. The rest is as per the prakriti yajna. Another classification is as follows: The Agnihotra is an example of a nitya yajna that must be performed everyday. The Ksamavatsiti yaga is a Naimittika (special cause) yajna that must be performed if one’s house is destroyed by fire. The Aindragnesti yajna is a kamya (wish) yajna which is performed to win a competitive venture. Alternately: In a saumika yaga, the havis is Somarasa, in a pasuka yaga, the havis is an animal, and in an aistika yaga the havis is purodasa (rice cake), ajya (ghee) or caru (a porridge of 4 kinds of grains and/or lentils). HINDU RITUALS AND ROUTINES – WHY DO WE FOLLOW THOSE? In almost every Indian home a lamp is lit daily before the altar of the Lord. In some houses it is lit at dawn, in some, twice a day – at dawn and dusk – and in a few it is maintained continuously (Akhanda Deepa). All auspicious functions commence with the lighting of the lamp, which is often maintained right through the occasion. Light symbolizes knowledge, and darkness is ignorance. The Lord is the “Knowledge Principle” (Chaitanya) who is the source, the enlivener and the illuminator of all knowledge. Hence light is worshiped as the Lord himself. Most Indian homes have a prayer room or altar. A lamp is lit and the Lord worshipped each day. Other spiritual practices like japa (repetition of the Lord’s name), meditation, paaraayana (reading of the scriptures), prayers, and devotional singing etc is also done here. Special worship is done on auspicious occasions like birthdays, anniversaries, festivals and the like. Each member of the family – young or old – communes with and worships the Divine here. The spiritual meaning is even deeper. The life force, the divinity, the Self or the Lord in me is the same in all. Recognizing this oneness with the meeting of the palms, we salute with head bowed the Divinity in the person we meet. That is why sometimes, we close our eyes as we do namaste to a revered person or the Lord – as if to look within. The gesture is often accompanied by words like “Ram Ram”, “Jai Shri Krishna”, “Namo Narayana”, “Jai Siya Ram”, “Om Shanti” etc – indicating the recognition of this divinity. Also Vishnu worshippers apply a chandan tilak of the shape of “U”, Shiva worshippers a tripundra of bhasma, Devi worshippers a red dot of kumkum and so on). 7. To touch another with the feet is considered an act of misdemeanor. Why is this so? In Sanskrit, tulanaa naasti athaiva tulasi – that which is incomparable (in its qualities) is the tulasi. For Indians it is one of the most sacred plants. In fact it is known to be the only thing used in worship, which, once used, can be washed and reused in pooja – as it is regarded so self-purifying.